Toddlers seem to grow up so fast. I’m sure you hear this every time you take them to see their grandparents, but it’s true. Only a few months ago, you were holding them in your arms, and now they’re running riot around your house. Despite the chaos that ensues by having a toddler, it’s essential that you don’t forget that this is one of the most important stages of their life. This is the stage where your toddler’s senses become very aware of their surroundings and will be looking to try anything and everything you put in front of them. One of the best things you can do at this stage is to encourage their sensory development, helping them to explore new ideas, concepts and sensations. And what better way to do that than with a new toy that they’re going to love. Sensory toys? Experiences? If you’re not sure what I’m talking about, don’t worry. To help you get started, here is a selection of some of my favorite sensory toys that my children loved and yours are sure to as well. What Are Sensory Development Toys and Do You Need One? To start my list, I’ve chosen what is easily described as one of the bestselling sensory toys available and is adored by millions of children across the United States. This is a highly interactive baby walker that your children can move around the house or garden at their own pace, which is perfect for building their confidence while walking. So, jumping straight into the ton of features that this walker has, on the front, you’ll find five numbered and uniquely colored piano keys that make their own individual sounds. These keys are perfect for fueling creativity and musical masterpieces. Also, you’ll find two funky colored spinners, three unique shape sorters as well as three LED, light-up buttons, all of which are designed to give your children an extremely interactive experience that they’re going to fall in love with. ​What’s more, you’ll even find a pretend telephone and well, you see what I’m saying, the list goes on and on. What's Great About It: In addition to all of the touch and play things that your children can interact with and look out, you can also enhance their hearing. 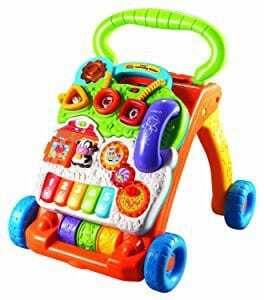 The walker has over 70 built-in singalong songs as well as more music, phrases and sound effects than you can count. Bowling is always a fun game to play, no matter what age you are, and with this set, you can introduce your child to the sport in the most entertaining way possible. As you can see, this is an extremely funky bowling game that comes with six pins. What makes these pins so special? 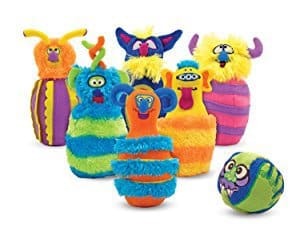 The fact that they are actually big fluffy monsters – your kids will be thrilled. Each pin in this set is completely unique from the others, coming in vibrant and attractive colors that your children are going to love to play with. As above, each pin has its own hand-stitched, fluffy feel to it. My children love playing with the pins as a separate toy just as much as they love bowling with them. ​Regarding the game itself, each pin is bottom-weighted to make sure that it’s easy to stand up and there’s a monster-style bowling ball to knock them down with. Whether you’re playing in the hallway, in the playroom or even outside, there are hours of fun to be had with this sensory toy. What's Great About It: In addition to all the amazing benefits this set has, from improving hand-eye coordination to encourage your child’s balance, there’s also a handy zippered carry case to keep the set in. This means that you and your family can enjoy the set no matter where you are. Balls have been popular toys for children since they were first invented using pig’s liver (I know, nice, right?) but they have come a long way since then. Take this highly interactive ball from Fisher-Price for example. Not only is this soccer ball highly entertaining, but it’s also incredibly interactive, making it one of those toys that my children just couldn’t put down. The ball comes with three easy play modes: learning, imagination, and music, covering all of the senses perfectly. You can cycle through each mode as you please, and there’s a ton of stuff to explore in each. There’s a load of built-in songs and phrases for your children to learn as well as team games where your children and their friends can pass the ball to one another. Music and sounds also play when the ball is dropped or thrown. 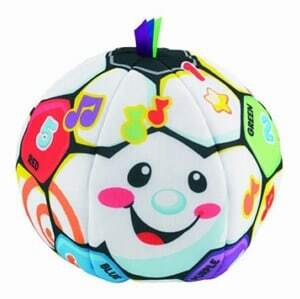 This ball can also teach numbers, how to count, color identification, opposites and so much more. What's Great About It: My favorite essential feature of this happy ball was the parental features. For example, there are multiple volume settings to ensure that you don’t get sick of the ball. You can also remove the outside fabric cover and wash it to make sure the ball stays clean and hygienic. Children love books and interactive sensory toys, so what idea could be better than to combine the two. The result is this beautifully made sensory rhymes book by VTech. Inside this gorgeous book, you’ll find six of the most classic nursery rhymes for your children to read to themselves or for you to read to them at story time or bed time. The book also contains over 40 songs as well as a collection of melodies, phrases and sound effects to captivate your child while engaging their senses. 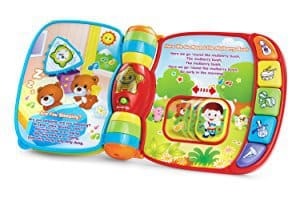 As you would expect from a leading VTech product, there’s also two styles of play: learning and music mode, which your child can choose as they please. ​Each page of this book is super colorful, highly stimulating and has all of the light-up features and flashing lights you could want. In short, this is the complete sensory experience. What's Great About It: As if all of these awesome features weren’t enough, the book also comes with five brightly colored piano keys. This is a great way to teach your children about colors and sounds as well as different instruments while improving their fine motor skills. As your child grows up, they’ll quickly start learning more and more words after they learn their first. Always remember that your child’s brain is like a sponge when it comes to information, so what better way to fuel this than a colorful first words book? 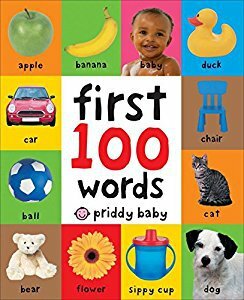 Inside this interactive book, you’ll find over 100 simple first words for your child to learn, all displayed alongside colorful and engaging photographs, making it even easier for them to remember the words. As you’d expect from a child’s book, this book comes in a board format, so you can be sure that it is built to last. This also means that it’s designed for tiny hands as there’s a gentle, soft padding around the outside. What's Great About It: What I love the most about this book is the re-readability. Learning 100 words is a lot of words to remember. But that doesn’t matter. That simply means you can return to the book over and over again whenever you need to. This is a question that pops up in my inbox time and time again. 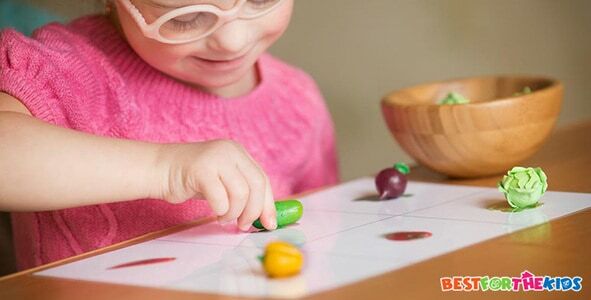 Most parents have heard of sensory development toys, but are either confused about what they actually are or about whether they’re actually essential when it comes to their child growing up. So allow me to explain. At its core, ‘sensory development’ is a term regarding your child’s motor skills. This is what they touch with their hands, how they see objects and how they hear sounds. In short, it’s how your children interact with the world around them using their senses. ​Another way to look at this is by imagining your child picking up an object, such as a ball. The size, weight, and textures of this ball will pass through the sensors in their hands and fingers, traveling all the way up to the brain for processing. ​The more practice your child has with developing these senses, the faster and more accurate the processing stage will be. ​It’s these senses that will be the foundation for thoughts and ideas in your child’s brain. The more your child is subject to sensory experiences, the more these experiences will become memories, which will fuel their problem-solving ability, creative thinking and imagination. ​This is why sensory toys can be such an essential part of the playroom inventory. Of course, your children will naturally engage in sensory experiences, but by actively encouraging them, you’ll be enhancing your child’s development, allowing them to jump forward in leaps and bounds. ​With sensory development toys, you’ll be taking your child’s development to the next level, and the earlier you introduce these toys, the better the effects will be. Whether you’re looking to treat your children to something special, it’s a birthday, or you want to jump-start your child’s learning capabilities, a sensory development toy is a great choice every time.